With the number of avenues opening up to secure leads, be it email or even a chatbot on your website, there are opportunities available by real estate software companies to build quality leads. 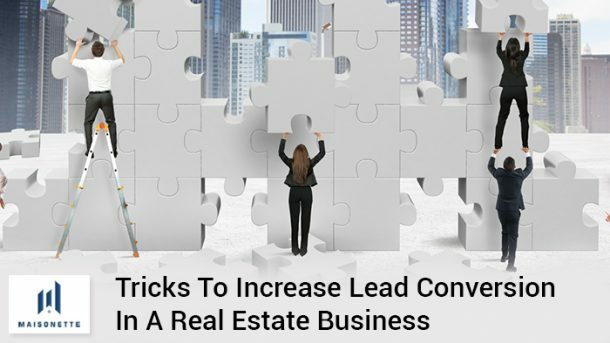 But with the level of sophistication that the market demands today, converting these leads has become tough, compared to a few years ago when the process was quite simpler. The genesis of managing, analysing and acting on inbound leads depends on the strategy in place. They can be divided into objectives and tactics. With online leads, start building appealing content with the help of content marketers, because the game of lead conversion is not lost or won because of your core proposition, but how you sell it to them. Lead conversion, therefore, must create successive stages of taglines, phrases or briefs that continue to appeal prospects. Studies prove this, especially a recent one by Demand Gen Report in 2016. It says 96% of B2B buyers are always looking for inputs from industry thought leaders. You are a thought leader if your lead strategies hinge on the quality of content that is placed across blogs, CTA buttons, emails and more. Property businesses can use the capabilities of real estate software companies to strengthen their strategies. There is the number of data sources that you can leverage today, even at the outset of a customer journey i.e. the lead acquisition stage. Using data provided by the lead, understanding interaction behaviour across customer touchpoints or combining data patterns from buyer personas can help you tailor your messaging and targeting towards these lead groups. The best software for rental property now even boasts capabilities like artificial intelligence which execute a deeper evaluation of the data, suggesting recommendations or a customized offer to increase the chances of lead engagement. The impact of personalization is proven by Statista, which talks about a 17% open rate for personalized emails, as opposed to 11% for non-personalized ones. Real estate software companies like Maisonette offer customer relationship management (CRM) solutions that use data insights to enable greater personalization. Real estate businesses cater to the third most important human need, something which buyers and sellers care about deeply: a home. Marketing cannot follow the trodden path when the market is evolving rapidly. Create operating procedures that allow practices that can be experimented, refined, discarded or resurrected, which gives the company scope to improve lead conversion. Studies by MarketingProfs show how 47% of marketers’ experiment with different subject lines, another key lead management tactic to improve email conversions. Leading vendors of property management CRM allow a business to move into a dynamic mode regarding call-to-action techniques. This could be in the form of tweaking the colour of the form submission button or engaging in A/B tests to understand customer engagement, learnings can be channelled into creating best practices. Creating a relentless schedule of follow-up emails or posts on social media is going to only harm your efforts, and not help it. You might be offering listings that are valuable to them but don’t oversell your product. Focus on quality, versus quantity. Prospects want to be contacted and reminded, but at a frequency that gives them time and space to consider your offer and how it matches their requirements. Hard-selling can result in throwing cold water over your fiery efforts. Property management CRM solutions like Maisonette’s Sales Management offers features like a dynamic contract or creation of a payment plan that is convenient to the prospect. That is providing value. Hard selling adds up to a statistic by a 2016 Hubspot study, revealing how 78% of consumers unsubscribe from emails that were too frequently sent by a brand. Customer experience is what matters today. This aspect takes lead conversion and optimization full circle. We started off talking about framing your lead management strategy that is centred around content, but the objective must be geared towards how your customers feel about your brand as you engage them through various marketing and media channels. Deploy conversion tactics and cater to their curiosity, but don’t overcook your communication practices. Infusing your marketing tools with the best accounting software for real estate you employ can help accelerate this effort. In fact, contemporary property management CRM like Maisonette allows unheard-of features in the real estate domain, like virtual reality (VR). It allows offering a simulated reality that comes closer home, in fact, closer to visualizing the home of the prospects dream. Despite the real estate business taking the digital path comparatively slower than other industries, the results are being increasingly felt, as companies vie for customers who are more demanding, understand more about the properties that you think of, and can detect coercive or manipulative approaches from a distance. Keeping the fundamentals of customer-business interactions top of mind and crafting goals and strategies to honour it can help build robust and sustainable lead conversion methodologies. Using enabling tools in the real estates’ domain like property management CRM or real estate marketing dashboards can optimise the process, driving synergies between different marketing constituents of the enterprise. This is very nice information related to real estate business. Thank you for sharing this.